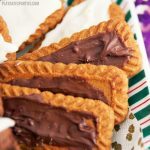 With a little bit of chocolate and this peanut butter icing recipe, you can fool your guests into thinking you spent hours baking delicious holiday cookies! Christmas is one week away. Are you scrambling to get last minute gifts shipped to your house? I definitely am. With everything else going on, what do you do if you have a holiday party to go to tomorrow, but haven’t had time to make a proper hostess gift or to do regular holiday baking? You cheat. That’s what you do. Take something store bought and spruce it up well enough to pass off as homemade. Then sit back and enjoy while everyone raves about how delicious your cookies are. What if I told you the entire cookie platter in the picture above only took 40 minutes to make from start to finish? …and it only took that long because I mixed peanut butter icing by hand. Yes, you can do this, and no you don’t have to feel guilty about it. A variety of cookies in different flavors shapes, and textures. Place wax or parchment paper on your counters to protect from drips and spills. Remove your store-bought cookies from the packaging and arrange on the parchment, right side up. Carefully melt your chocolate in the microwave. Start by heating it up for 30 seconds, stir with a fork, and then heat in 10 second increments until the chocolate is smooth. Using the back of a spoon, carefully spread a layer of chocolate on the middle of the cookie. Don't worry about making it look perfect. You want them to look homemade! Dip the tines of a fork into the chocolate, and then carefully drizzle, or flick, the chocolate back and forth over the cookies. 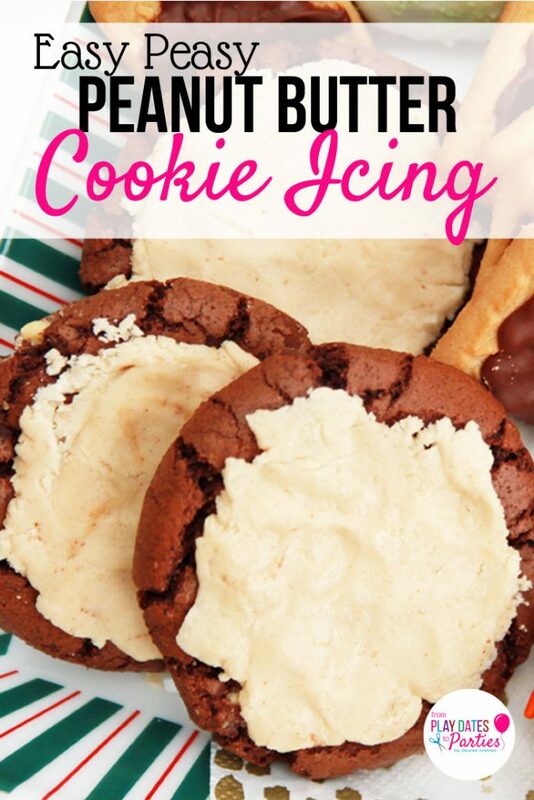 Make a quick homemade icing, and spread it on top of the cookies using a butter knife or offset spatula, if you have one. Tips for Making Store-Bought Cookies Look Homemade Look first in your grocer's fresh bakery section for basic cookies that aren't frosted. Simple sugar cookies and macaroon cookies work well. Next, look for variety packs of simple, flat cookies. Remember the shortbread assortments that come in tins? those are perfect. Other good options include plain chocolate cookies and simple Biscoff cookies. Look first in your grocer’s fresh bakery section for basic cookies that aren’t frosted. Simple sugar cookies and macaroon cookies work well. Next, look for variety packs of simple, flat cookies. Remember the shortbread assortments that come in tins? those are perfect. 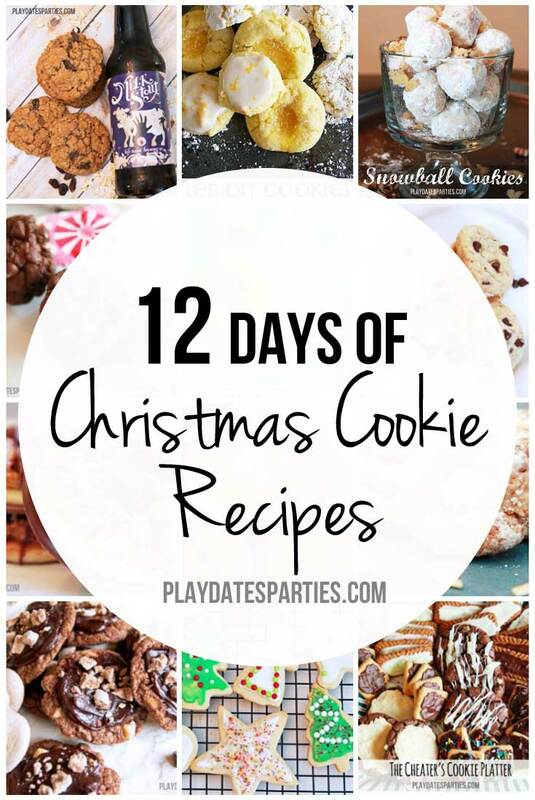 Other good options include plain chocolate cookies and simple Biscoff cookies. 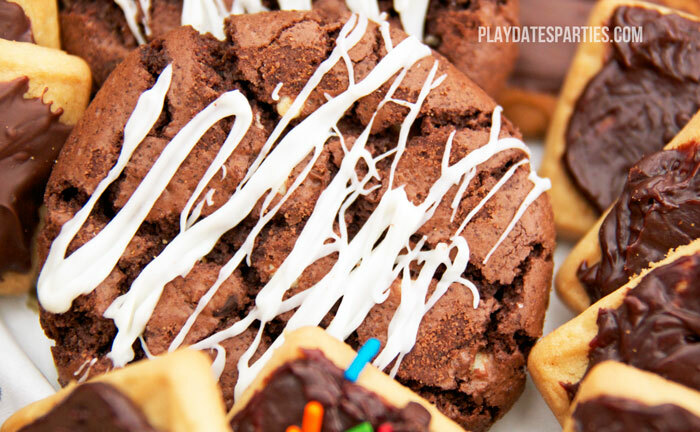 Just a little swipe of chocolate…yum! 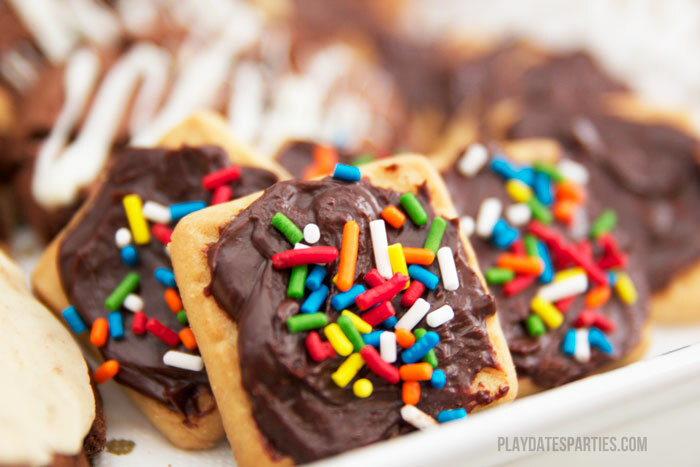 Sprinkles are a festive touch. Drizzled chocolate is easy to do, and looks just a touch fancier. If you want to add a personal touch to your platter, homemade icing is the way to go. It only takes a few minutes to make, and is a fantastic way to add variety to toppings on your platter. In other words, it makes the whole platter look like you spent hours baking a bunch of different cookies. 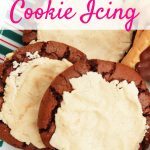 This recipe is very similar to the icing I used to make the best cut-out sugar cookies and lemon clove cookies. 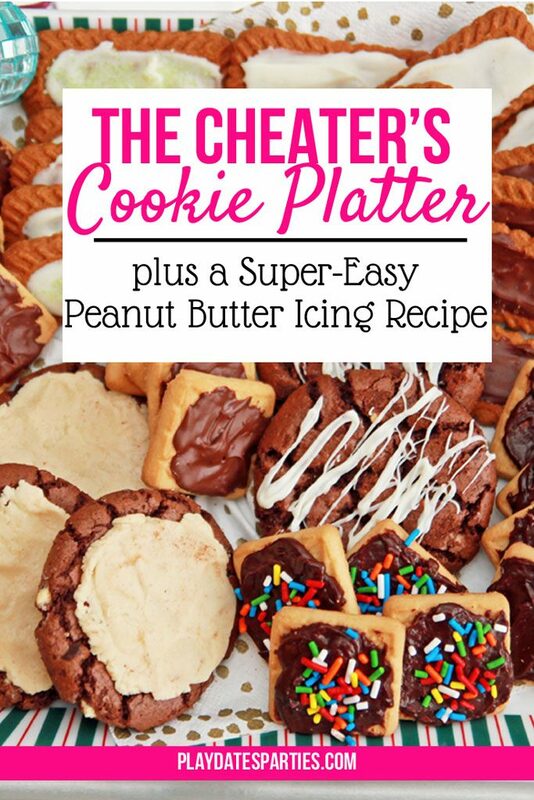 The ingredients needed adjusting to account for the peanut butter, but the result is an icing that is perfect for cookies that are going to get layered on a platter like this. Place milk and peanut butter in a bowl. Mix in small amounts of powdered sugar until icing consistency is reached. The mixture should be thick. Mix in corn syrup until thoroughly combined. You can use a handheld mixer or small food processor to make the icing, but I usually just mix everything with a fork or small whisk. Next time, I might just use Biscoff cookie butter instead of peanut butter. Mmmmm…… The possibilities are endless! 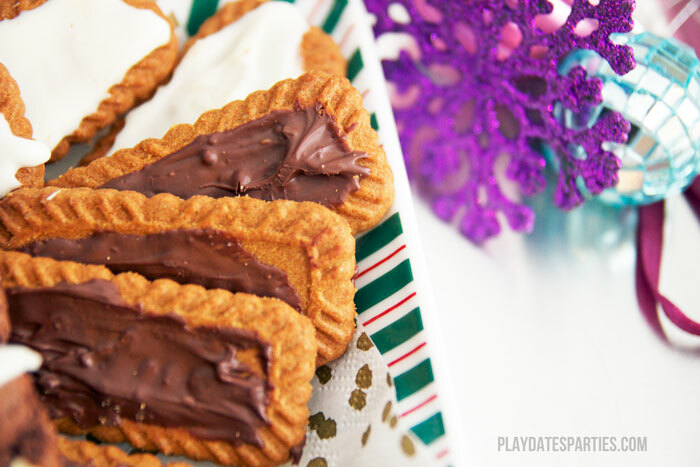 What cookie would you use with peanut butter icing? 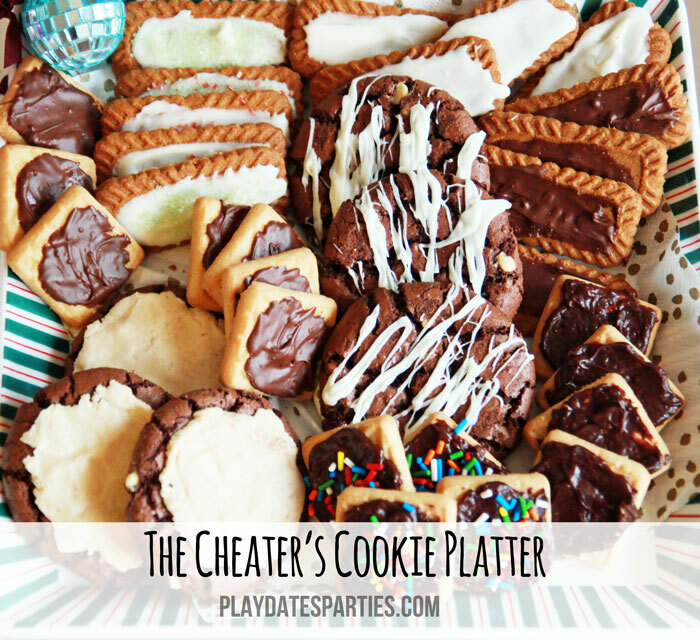 Would you ever create a cheater’s cookie platter?